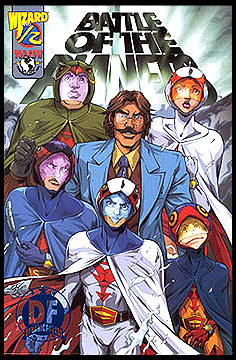 Information: The first half of this book covered brief looked at the origins of G-Force, and how they started on the team. The second half included more Alex Ross sketchbook images (a mostly different selection than previously published in the Sketchbook issue, plus a four-page section of art and bios for the G-Force team. This issue was only available through a special offer in Wizard Magazine #132. Each copy came with a protective heavy plastic sleeve which included a holofoil Wizard logo, and a certificate of authenticity from Dynamic Forces, Wizard and Top Cow. This cover design by Wilson Tortosa was adorned with a blue foil Dynamic Forces logo. This edition was limited to 5000 copies. Art by Wilson Tortosa, story by Munier Sharrieff and Jason Hofius. Full Color.